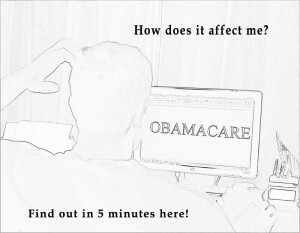 If you currently have insurance through Medicare, Medicaid, Medi-Cal or CHIP then you can stop reading. If you have a private plan or insurance through your work, then you may benefit from going and getting your insurance from an exchange if your income is within a certain range. For everybody else, Obamacare can be a really good thing or a burden based on the amount of money the government pays on your behalf. The following group of people would get NO help and are required to pay the full price of insurance themselves. A single person with no dependents who in 2012 made more than 45,960; 2-person household with income over $62,040; 3-person family making over $78,120, a 4-person family with 2012 income over $94,200 and the limit goes up for larger families. If you are wondering what your income was – look at the bottom of page 1 of your 2012 tax form 1040 and most of you will find the amount there. If you are in this category then you would ask yourself – so now what? You have 2 options. Get insurance for everybody at home (from an exchange, privately or through employer), which carries at least the minimum required coverage, or Bronze level. After you find out how much it costs, you will probably get a headache. Or if you say: “No, thanks! !” then you may be subject to penalties. If you are in an income category under the limits mentioned above, then you may benefit greatly from this new law and you need to read further. There are 4 levels of insurance that are given metal names: Bronze, Silver, Gold and Platinum. The plans get more expensive as the value of the metal increases but provide more coverage. There are some details that apply to all: The only way to qualify for assistance credit is by getting insurance through an Exchange. Income is the MAGI from 2012 and will be used to determine the amount of your initial subsidy (help) from the government. The actual amount of the subsidy is verified when you file your 2014 taxes in the beginning of 2015 through a rather complicated calculation. You may end up having to repay some of it or claim extra and get money back. Therefore it is important to be proactive during 2014 and if you start making significantly more or less money than in 2012 or your marital situation changes, you have to notify the exchange and have your subsidy adjusted. Now on to some specific cases, where you can click on the one that applies to you. One of the most important factors is if your work offers health insurance coverage or not. Premium Assistance Credit and Calculation – this page gives more details about the credit and how it is calculated. This is a lot of information to take in… and I hope this text helped you get a better understanding of the new rules and the way they affect you. If you have questions or need tax advice, feel free to contact Kay Endow & Associates and our Obamacare expert Danko.